Cantata journey : a documentary. 1. Hermannsburg -- 2. Idracowra -- 3. Horseshoe Bend. SUMMARY: Documentary about the cantata 'Journey to Horseshoe Bend' composed by Andrew Schultz, with librettist Gordon Kalton Williams. The work was first performed by the Sydney Symphony, with the Ntaria Ladies Choir from Hermannsburg in Central Australia, the Sydney Philharmonia Motet Choir, and soloists, conducted by David Porcelijn. Includes interviews with the compsoer, librettist and members of the Ladies Choir. Follows the rehearsal process for the Ntaria Ladies Choir and their journey to Sydney for the premiere performance. "Contains selections from the world premiere of the Canata 'Journey to Horseshoe Bend', performed at the Sydney Opera House in May 2003". DVD produced and directed by Hart Cohen. Score [ePDF]: Journey to Horseshoe Bend : [ePDF] / music by Andrew Schultz ; libretto by Gordon Kalton Williams. 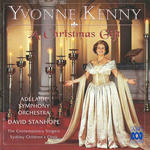 CD: A Christmas gift / Yvonne Kenny.